A mate of mine, Colonel Cris Anstey, was the commandant of the (Australian) Army Logistic Training Centre at Bandiana and I completed this project as a farewell presentation. The ALTC is responsible for general and water transport, ordnance, medical and supply training, among a multitude of other roles. 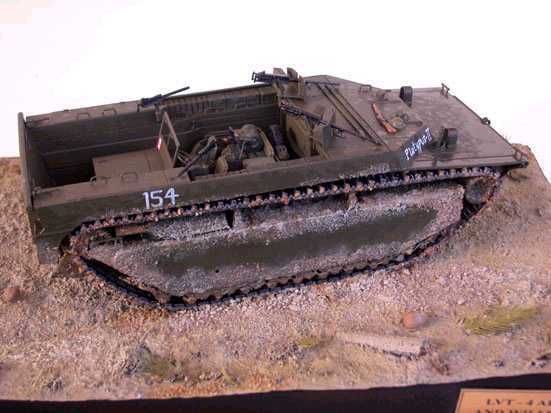 I wanted to build an historic vehicle which reflected these roles and when the Italeri 1/35th LVT-4 came along I immediately thought of the famous series of photographs of the US-crewed amtracs supporting Australian forces at Balikpapan, Borneo, in June 1945. After trawling through the Australian War Memorial photo database, I chanced upon a picture of an LVT-4 with the distinctly Aussie nickname "Platypus II''. Although a welcome release, the Italeri LVT is not without its problems. The vehicle is a post-war variant which seems to have some features peculiar to a vehicle in service with the Italian Army in the 1960s. 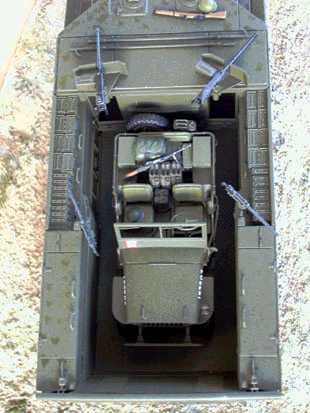 In order to depict a World War II vehicle at Balikpapan I cut out the co-driver's hatch, filled in the hole, and repositioned it level with the driver's hatch. I also filled in the locating points for the vision blocks, fitted the simple armoured flap for the driver, scratch built periscopes for both hatches and fitted other small detail. If I decided to be really clever, I could have opened the hatches, necessitating some interior detail, and revamped the cargo area floor to make a truly accurate World War II LVT, but, hey, this was a no-brainer project. That said, the propulsion vanes at the rear were unacceptably heavy-handed and I scratch-built new items, which wasn't such a daunting project, from thin plasticard. On the basis US forces gave the shore a pounding with everything they had as the first waves were going ashore in any island hop, a selection of .30 and .50 cal ammo boxes were placed in the interior sponsons. Markings were hand painted free hand, just like the originals. The Jeep is the newer Tamiya offering loaded with various Verlinden and Italeri bits. I don't know if Cris will notice, but the marking on the Willys match those on a Jeep on display in the excellent Bandiana Army Museum, which sports original markings from a vehicle serving with an Australian infantry battalion as part of the British Commonwealth Occupation Forces in Japan post war. Once again, am unsure if that vehicle was at Balikpapan, but this is a no-brainer. Being in the throes of moving house, I painted the two built kits with a Humbrol spray can of olive drab after giving the LVT a thorough coating of sand and beach debris mixed with watered-down white glue. The diorama base was Spakfilla with various tree trunks and leaves embedded in it and a liberal coat of river sand. Once the LVT was set onto the base, I sprinkled sand onto thinned white glue to blend it with the terrain. I then gave the lot a coat of matt lacquer before various washings and dry brushings. I then roughly painted gloss lacquer up to the water line and gave the whole creation, including its cargo, a spattering of gloss lacquer with a tooth brush. The result is meant to depict a newly beached LVT covered in sea spray during its trip from ship to shore. The flex-mounted .50 and .30 cal Brownings are straight from the kit. Once again, more detail such as ammo belts could have been added, but this was a minimalist project. I have no idea how accurate the final offering is, but it looks like a US-crewed LVT-4 supporting the Australia forces at Balikpapan and my mate Cris was delighted with the presentation. Personally, I had great fun... it took me back to the days when I just built a model for the hell of it without the constraints of competition judges and fastidious research. And, unlike my more high-brow competition contenders and would-be museum displays, this project was actually finished!